Things aren’t looking good for Sam (Bret Harrison), Sock (Tyler Labine), Ben (Rick Gonzalez), and Andi (Missy Peregrym). And this time, it’s not the Devil (Ray Wise) that’s causing the trouble. Though Reaper seems to have a couple million devoted viewers, it’s looking pretty certain that the show will be ending its run this May. Do you enjoy the show? Would you like to see it continue? Well, there are a few things you can do. We’ve created this page to keep track of the ways that viewers can show support for Reaper. Essentially, the most important thing to a network is for as many as possible 18-49 viewers. The more that watch, the more money the network can charge for their advertising. Watch every episode on TV — live, if possible — and encourage others to do the same. Perhaps one of them is secretly a Nielsen family! Express your passion for the show but be respectful and polite. Everyone responds best to courtesy. E-mails are nice but personal snail-mail is even better. Besides The CW, contact ABC Studios (who produces the show) and encourage them to continue producing the show — either for the CW or for a Disney-associated channel like ABC Family. Helpful hints: Use your real name rather than a screen name or “anonymous.” Explaining why you love the show is much better than “I support this petition.” Sign a petition only once. Spamming isn’t helpful. Get in touch with other fans and become involved with their efforts. Here are just a few that are out there. Search your favorite social network to find more. Here are a places populated with fans that are dedicated to saving the show. If you have a blog or website, you can use this button to let people know you want Reaper to continue. To use it, right click on the image and save it to your hard drive. Upload it to your site or blog and then link it to the petition, this page, or another Kyle resource. Consider posting a video about why the show should be saved. Some viewers may not read news online but many do watch YouTube videos. Are you doing something unique to try to save Reaper? Let us know by posting below! ВЕРНИТЕ СЕРИАЛ, ОН ОЧЕНЬ ХОРОШ, ОН ВСЕМ НЕОБХОДИМ! РЕЙТИНГ ПОДНИМЕТСЯ!! RETURN series, he is very good, it all needed! RATING will rise! I am from Siberia! I like REAPER!!!!!! SAVE!!!! PLEASE!!!!!!!!!!!!!!!!! 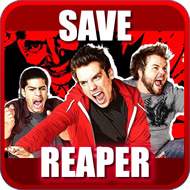 I want to watch 6,7,8,9,10,11, …….seasons of REAPER!!!!!!!!! SIBERIA LOVES REAPER!!!!! !